Rabbit starvation: Man cannot live by rabbits alone - the meat is too lean. Add fats and a few carbs to the proteins in lapin, and you can easily survive. 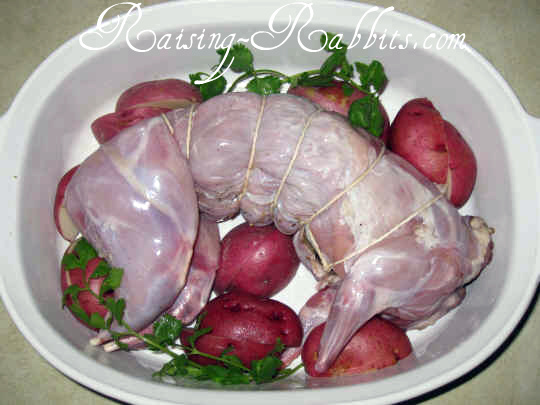 Rabbit meat - lapin - is typically too lean. Humans need a certain amount of fat intake, certainly more than a wild (or domestic) rabbit provides. 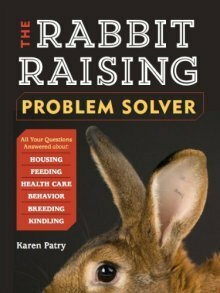 The problem is not limited to rabbits, of course. Any diet high in protein, low in fat and devoid of carbohydrates, will result in not enough energy for your body to function properly in the long term. The name "rabbit starvation" may have been coined by an arctic explorer by the name of Vilhjalmur Stefansson, who spent many years in the early 1900's living with the Eskimos and Inuits of Alaska and Northern Canada. Mr. Stefansson wrote, "The groups that depend on blubber animals are the most fortunate in the hunting way of life, for they never suffer from fat-hunger. This trouble is worst, so far as North America is concerned, among those forest Indians who depend at times on rabbits, the leanest animal in the North, and who develop the extreme fat-hunger known as rabbit-starvation. "Rabbit eaters, if they have no fat from another source - beaver, moose, fish - will develop diarrhea in about a week, with headache, lassitude, a vague discomfort. If there are enough rabbits, the people eat till their stomachs are distended; but no matter how much they eat they feel unsatisfied." The Indians of the north hunted older reindeer bucks, because they carried an enormous slab of back fat that could weigh up to 50 pounds. They then made pemmican by mixing fat with meat in a proportion of one-to-one by volume. By caloric content, the pemmican amounted to 80% of mostly saturated fat calories to 20% protein calories. And don’t forget - among the northern Indians, cancer and heart disease were nonexistent. Anyone who is compelled to live for several weeks on little but lean meat will actually experience rabbit starvation. Without fat or carbohydrates, it will make no difference the quantity of meat ingested. He will be hungry after every meal and will lose strength or become ill.
Mr. Stefansson described a time of life as follows: "With a diet of lean meat everything was different. We had an abundance of it as yet and we would boil up huge quantities and stuff ourselves with it. We ate so much that our stomachs were actually distended much beyond their usual size - so much that it was distinctly noticeable even outside of one’s clothes. But with all this gorging we felt constantly hungry... One by one the six Eskimos of the party were taken with diarrhea." Carbohydrates are formed from carbon, hydrogen and oxygen. Fats are formed from the same three components. However, to form proteins, the body must add nitrogen and other nutrients to these three building blocks. Your body normally burns fats as energy, and your brain burns glucose, a sugar. The body CAN burn protein, but it is not a healthy long-term solution. Protein, when broken down, forms ammonia and other by-products which the body has to cleanse away, straining the liver and kidneys. The amino acids from protein are converted into glucose by the liver. The process is complex and requires a large amount of energy. ATP (energy molecules) are used to convert amino acids to glucose, and even more are then required to convert the harmful protein byproduct ammonia into urea which is flushed away by the kidneys. Here's the problem: the body can only supply roughly 1000 calories per day through a protein-only diet because the liver is only capable of producing 250 grams of glucose from protein, no matter how much protein you eat. So, you will still feel hungry, and you'll eat more. Unfortunately, your liver will start struggling and failing to convert the ammonia into urea (not enough ATP) so the ammonia will reenter your blood stream. This starts messing with your nervous system. "Excess intake of nitrogen leads in a short space of time to hyperammonemia, which is a build up of ammonia in the bloodstream. This is toxic to the brain. Many human cultures survive on a purely animal product diet, but only if it is high in fat. "A lean meat diet, on the other hand cannot be tolerated; it leads to nausea in as little as three days, symptoms of starvation and ketosis in a week to ten days, severe debilitation in twelve days and possibly death in just a few weeks. A high-fat diet, however, is completely healthy for a lifetime. "All of the hoopla that the media puts out about how a low carb diet is bad on the kidneys stems from the excess protein, not the high fat content. You cannot eat your fill of just lean proteins. You must add fat to keep you healthy. Also a higher fat content ensures weight loss too." So go ahead -- enjoy elegant rabbit dinners. But eat veggies with your lapin and be generous with the butter. When we make rabbit stew, we don't skim any fat off the top of the broth...there is not very much anyways, usually. If you eat a diverse diet of meats, fruits, veggies, etc., you'll not need to fear rabbit starvation. And by the way, supposing you have nothing but rabbits on which to survive, you would do well to eat everything edible of the rabbit, not just the meat. Eat the liver, kidneys, the fat around the kidneys, and the brains. Crack the bones and eat the marrow. Singe off the fur and eat the skin as well. Don't let this gross you out - if you're alone and starved, you'll be grateful for nourishment that prevents rabbit starvation. And while you’re at it, surely you should be able to find some fresh dandelions or edible greens to add to your fare. By this method you should be able to add somewhat more fats and carbs to your survival fare.